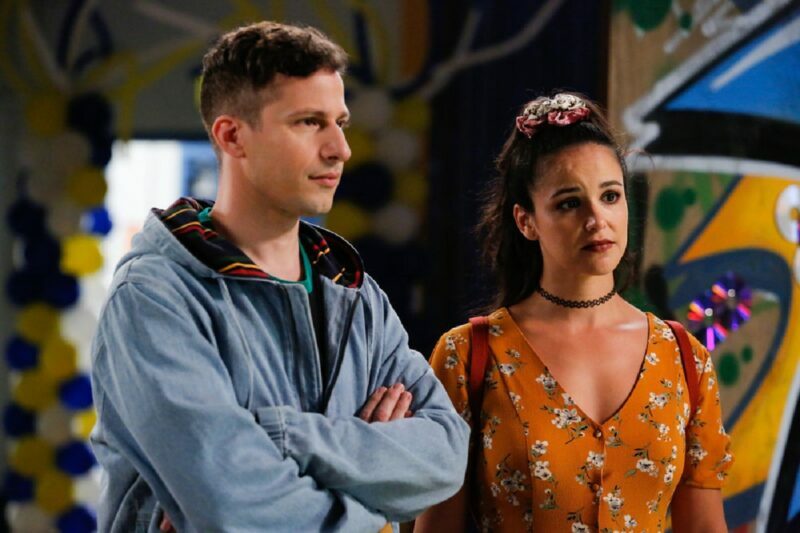 Andy Samberg as Jake Peralta and Melissa Fumero as Amy Santiago in ‘Brooklyn Nine-Nine.’ Image courtesy of Vivian Zink/NBC. Last week’s episode of Brooklyn Nine-Nine transported us back to the 80s with the origin story of Hitchcock and Scully. 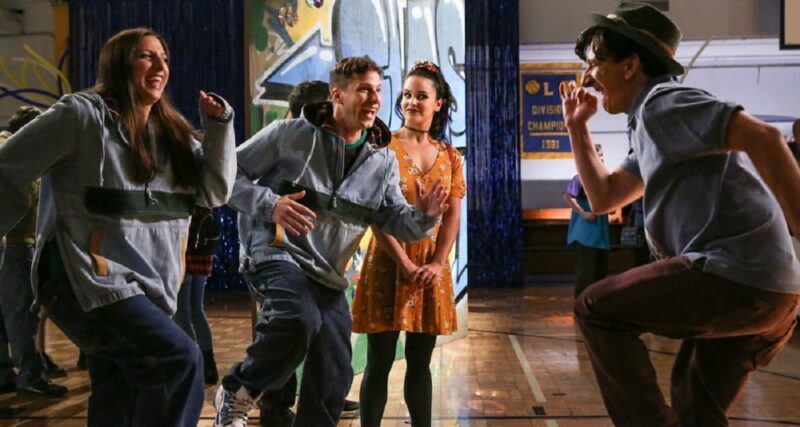 And this week’s episode takes us up one decade to the 90s as Peralta and Gina get prepped for their 90s-themed high school reunion by donning their “super fresh” high school attire: denim sweatshirts and JNCO jeans. However, all the reminiscing brings back an unpleasant memory for Peralta – his rejection by the coolest guy in school, Brandon Bliss, for tattling on him about his plan to steal a school van to go buy some booze. This earned Peralta the nickname of “The Tattler,” despite Peralta maintaining that he was not the one who ratted out Bliss. Holt walks in on Terry, Hitchcock, and Scully listening to an FM radio competition, where listeners have to call in and guess what makes the crinkling sound the radio hosts played. Holt initially judges them for their lack of productivity while they crinkle everything in the breakroom trying to match the sound, but his competitive nature takes over and draws him in to the game. 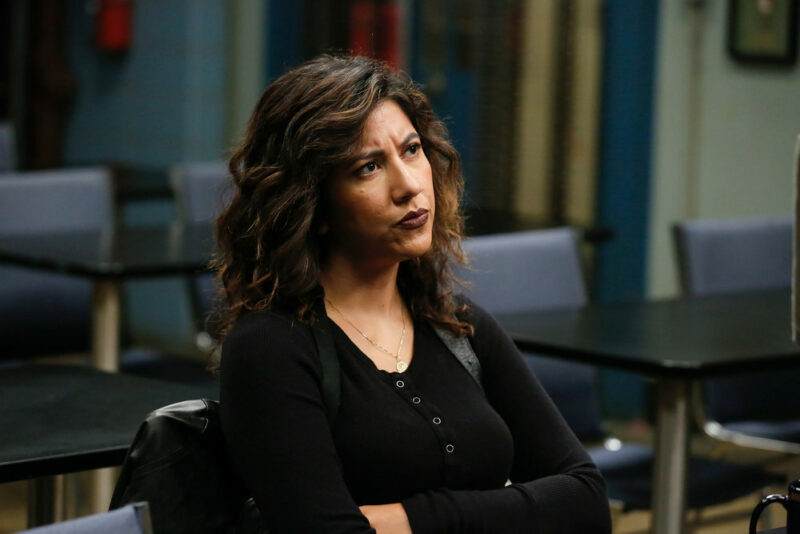 Stephanie Beatriz as Rosa Diaz in ‘Brooklyn Nine-Nine.’ Image courtesy of Vivian Zink/NBC. Meanwhile, Rosa seeks out Boyle’s help with a relationship problem. Boyle is overjoyed (or “so juiced he’s drowning in it”) to learn more details about Rosa’s personal life. Rosa explains that she has been dating two people who recently learned about the existence of each other when they both tagged her in photos on social media. (We also learn through this exchange that Rosa regularly goes to brunch and has her own handmade jewelry business.) Her romantic partners are forcing her to choose, and her normally decisive nature is failing her and she cannot choose. Boyle is eager to help, claiming that because Boyles are “an indecisive people,” they have developed a foolproof series of questions that can help make any decision. While they go off to investigate, Gina has been wandering around the reunion, making wild claims about her successful life. (She wrote all the Thor movies, she was the architect of the Freedom Tower, etc.) She eventually runs into an old classmate-turned-tech investor named Quentin (played by Yassir Lester). She pitches him an app called Todddddler (“How many ‘d’s are in the spelling?” asks Quentin. “………five,” replies Gina), which is, according to Gina, “Tinder for Toddlers,” so that parents can set their kids up on playdates with kids that meet their desired coolness. Quentin loves the idea and offers to fund it, and Gina finds herself in over her head. Rosa answered all three hundred and nine of Boyle’s questions but her two partners (dubbed “Couscous” and “Quinoa”) are still dead even. So Boyle hoists her upside down so that “all the blood can rush to her decision center,” in a pose that his family calls “the upside down coward.” This doesn’t work either, but the long process and Rosa’s refusal to choose has left one of her partners so frustrated that they break up with her, making the choice for her. Boyle claims this as a victory for his method. Peralta and Gina make up, and then Peralta goes to Quentin to convince him to still work with Gina. Unfortunately, it turns out that Quentin was also lying like Gina was, and he cannot actually invest in her app. Peralta tells Gina that it is now his turn to be her “origin story” and that she has outgrown the Nine-Nine — she needs to quit, so that she can pursue her larger dreams and ideas. She decides that she will. And so we must begin saying our heartfelt goodbyes to “one of the greats,” Gina Linetti!